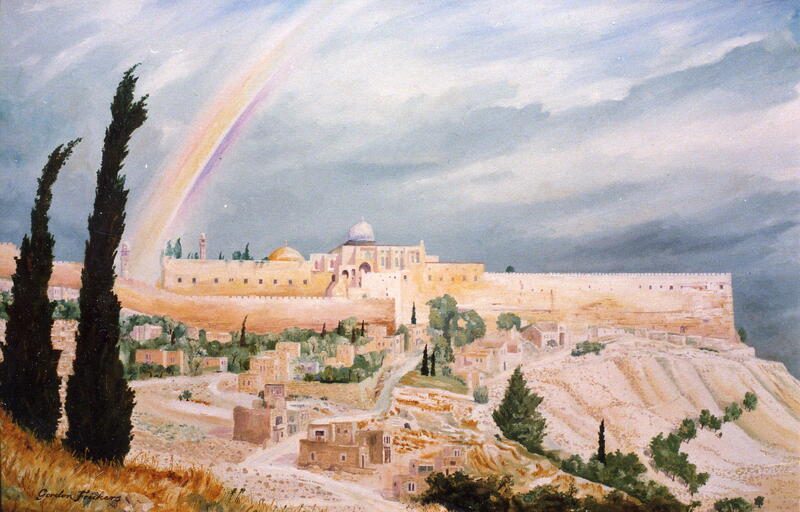 About this painting of Jerusalem, 1984, a general view including the site of what was King David’s City. During the many long painful centuries of exile, Jerusalem symbolized both the glorious past of the Jewish people – and their hopes for the future. The city has been mentioned in the daily prayers for all that time and plays an important role in the Passover service. Jerusalem; the site in the fore ground is that of the original David’s City as it appeared to my eyes in 1984. Arabs not only built on the ancient Hebrew names but also on ancient Jewish ruins. You can see the mixture of Arab frescoes, houses ruined, exposing a rich historical layer. The Dome on the Rock, The Al Aqsa : possibly the most controversial, some say infamous mosque in the world. The Moslem Mosque that stands upon the ruins of the Jewish Temples. The Al Aqsa mosque was originally constructed to prevent the rebuilding of the Jewish temple, Islamic attitudes to Jews go back a long way, today it is one of the main mosques in the Islamic World. Like so much in Jerusalem and Israel, when it comes to history there is some blurring between mythology and reality and the mosque’s exact origins are unclear. Many believe it was built on the site of a 6th century Byzantine church; others believe it is an 8th century construct by the Umayyads. This is the site associated with the myth of Prophet Mohammed taken up to heaven. A tale that is probably an early example of Islamic propaganda because in fact Jerusalem is not mentioned once in the Koran. For sure, it is one of the oldest Islamic monuments in the world, built between AD 688 and 691 during the Umayyad Empire and the original building was twice the size it is today. It is now considered the third holiest site in Islam, after Mecca and Medina. Like much of the region, the mosque was hit several times by earthquakes and what exists today bears little resemblance to the original structure. A pitiful, poorly thought out detestable idea. In recent years there has been a considerable effort by Muslims to dig into the mount and destroy all evidence of Jewish antiquity on the site. They ahve probably weakened the sub structure so what happens when the site is next visited by an earthquake? You tell me ! Doubly a bad idea, as if by vandalism, destroying the physical antiques it will in some way break the historical links, when in reality the Jewish presence makes the mosque unique, has and does enhances the fame of the mount and mosque. That is something to celebrate not vandalize. Al Aqsa infamously gave its name to the second Palestinian Intifada which began in 2000 after Israeli politician Ariel Sharon made a visit to inspect the site. The Al Aqsa is a fully functioning mosque, holding prayers every day for up to 5000 Muslims (only) at once. It is much plainer and of less interest to tourists than many other mosques. In my opinion the whole Temple Mount area is a mess, a disgrace to Islam, the world in general and an insult to the Almighty. That is not to say I want Muslims banished from the site; I wish for a complete re appraisal of the site, who may use it and how. Entering the gates of the Mosque complex has never been straightforward. It is dependent on prayer times etc. Needless to say it is almost impossible at the moment. To the Jews this is the Temple Mount, the holiest of holies where the Torah forbids Jews to tread in case they inadvertently step on the long-hidden tombs and destroyed temples of the ancient Jewish kings. To Muslims it is Haram ash-Sharif, where Prophet Mohammed ascended to heaven. For both religions, it’s also purported to be the site where Abraham was instructed by God to sacrifice his son Isaac. Whatever, it’s one of the holiest and most hotly disputed pieces of land anywhere on earth. It remains a central target for fanatical religious groups who want to destroy parts of it, others who want to rebuild the Temple. Recent history has taught the Israeli security forces to be prepared for any kind of a lunatic operation. Underneath the enormous golden dome that can be seen from miles around the city, is the sacred rock where by tradition, Abraham nearly sacrificed his son on God’s command, stopped at the last moment again, by G-d’s command. The Jewish tradition sees the rock inside the Dome of the Rock as the “Foundation Stone” from which the world initiated. This is also where Abraham almost sacrificed Itzhack. This is the location of the first and second Temples of Jerusalem. The Muslims believe that the Dome of the Rock is built on the place where Muhammad rose to the skies during the Night Journey (‘Asraa’) from Mekka to the Temple Mount. According to this tradition, Muhammad entered a cave to sleep, and from there he was taken by an angel to meet Moses, Elijah, and Christ. The Muslims believe that the footsteps of Muhammad may be seen in the stone, and that two hairs from his bears are kept in the structure. For certain, this city, Jerusalem, Zion, is one of the most mystical, stirring, inspiring places on Planet Earth.